It’s so hard for a housecat to find suitable prey on “The Inside”. I must be ever vigilant for things to stalk. You can’t let your stalking and killing skills grow lax. Movement is a critical element in stalking, and indoors there just isn’t that much that moves. 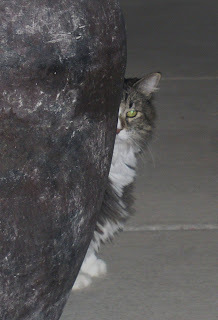 I’m generally forced to stalk Mommy, but she isn’t much of a challenge. She's rather slow moving, so chasing her isn’t real challenging. Let’s face it even a hard bite to the ankle isn’t likely to bring her down (I’ve tried plenty of times and it just gets me in trouble). Of course when the weather is nice I spend hours on the porch stalking the birds that gather there, but now that the weather is too warm I’m forced into an indoor life. The only good thing about the hot weather is that everyone wants to be inside, including my prey. I am the Mighty Bug Huntress! My bug hunting prowess is known throughout the land (well, at least I hope it will be now). No bug makes it into my realm without my knowledge (except maybe ants, but who cares about them?). Land rovers are immediately killed with a hard blow by my paws, a one-two punch, after I’ve toyed with them for awhile. Mommy will beg me to finish them off as she screams from a nearby perch (sometimes I let them live just to mess with her). The flyers require special assistance from Daddy, as he and I hunt together. I will spot the prey high above, and call attention to it’s presence with my constant cries. Finally my parents will realize the potential peril they're in, and thank me for spotting the danger. Daddy gets a rubber band, or a swatter, and we begin the hunt in earnest. Daddy’s aim is legendary with a rubber band, but occasionally he misses and then we search together for the intruder. When Daddy finally brings it down to the floor I finish it off with my paws of death. In my younger years I felt I should also dispose of the beast’s carcass, but nowadays I feel my work is done once I’ve landed the death blow. No one likes the taste of moth anyway; they tend to repeat on you. This has been a difficult week at our home. It all started with an alphalpha hair which later morphed into an alphalpha cluster. What’s an alphalpha hair you might be asking? Well I’ll tell you, but any long hair cats out there probably know exactly what I’m talking about already. I have two very distinctive types of coat that run along my back and sides. There are guard hairs which are long, sleek, and typically lay very smooth, and my undercoat. My undercoat is very soft, like mink (so I’m told, I’ve never felt a mink), but unfortunately it tends to knot easily. An alphalpha hair is created when someone pets against the grain (which is so irritating after I’ve spent hours to get everything just right) in combination with my efforts to lick it back into place. The two factors can cause a knot. The matted hair then shoots out from beneath the topcoat, calling attention to itself like a freakish beacon, an arrow of grooming humiliation. I’m still unclear on why Mommy calls it an alphalpha hair but it has something to do with “Our Gang” (I guess "My Gang" would be Mommy and Daddy, so I’m still confused). Mommy hates an alphalpha hair, and a cluster of them drives her completely nuts. It would almost be worth creating them just to bug her, but truth be told I don’t like them either (they ruin my sleek lines). Sure, I could leave when the petting starts to go against the grain, but since it’s Daddy doing the petting, I allow it. I’m what Mommy calls a “Daddy’s Girl”. Here is where the classic struggle begins – both Mommy and I want the alphalpha gone but we both hate having it removed. So, while it’s riding high, snuggle time becomes a battle of wills. There’s hair pulling (mine), biting (me again), bloodshed (Mommy’s), crying (both of us, but mostly Mommy), and hurt feelings (again, both of us). In desperation for a happy home once again, Mommy tries to sneak up on the hair with a pair of scissors. By this time I’m ready for a fight anytime Mommy moves her hands towards the area (and really just the sight of a pair of scissors in Mommy’s hands, even on a good day, is enough to make me angry), so it’s a dangerous time for everyone. “If you just let me cut it out we can be done with all this unpleasantness!” Mommy will beg. In desperation myself, I will pretend I don’t notice the giant pair of scissors, and I sit still long enough for her to perform the knotectomy. It’s been a rough week, but now joy and snuggling can, once again, be had by all. Ever since Mommy and I decided to start my blog it’s been like having the paparazzi right in my own home. Mommy wants to add photos of me to the entries we will be making, so she started trying to get some pictures of me. I can certainly see why she thinks my public would enjoy seeing me, I’m adorable after all. My family isn’t big on picture taking, in fact all of our family photos fit in one small file box. Even when they abandon me to go on something they call “Vacation,” all they come home with are postcards. I thought it was because they didn’t want me to see them having a good time without me, but now I know the truth - they have very little skill. It’s best they leave the photography to the professionals, who know about things like angles, and lighting. I should have seen that this desire to capture my kitty essence on film could develop into a real problem for me, and maybe I should have suggested a stunt cat. At first, I was more than willing to sit for my portrait. Okay, maybe “willing” is a stretch, but at least I didn’t feel the need to hide under the bed to find some privacy, like I do now. Things started simply enough, my parents would wait for me to do something cute, or just look regal, and then they would whip out the camera to capture it. I would pretend not to notice as they tried to frame the shot, and then snap we were done - I thought. Unfortunately, my parents weren’t taking the shots they had hoped for. I’d done my part, by looking my best, of course, but they’re slow with the trigger finger. How long can a cat be expected to wait as they fumble about? The fact that Mommy’s camera flashes first and then waits a few seconds to actually capture the shot doesn’t help either. Someone here (no one seems willing to take responsibility for this), thought it might be a great idea to sneak up on me in my sleep, gently arrange me into a cute pose, and then awaken me to get “the look” they wanted. Well, no one likes to be awakened from a nap by flash bulbs, this isn’t Hollywood. So until the trauma wears off, this is the best shot you are going to see of me. One of my favorite activities is to spend time on the back porch with my parents. I like to roll around in the dirt and leaves that gather there. How I love the crunch of a leaf as I roll across it, it’s such a satisfying sound. The only thing that comes close to that pleasure in the house is the sound of rolling around on Mommy’s expensive art papers. I love to lay in the huge patches of sun available to me. Although I have to be careful because I can get a bit overheated - so I have to pace myself, a few minutes in the patch, and then back to the cool of the patio. The other nice thing in the great outdoors is that anything I do is somehow different and heightened in my opinion, and in my parent’s opinion too. For example, I’ll take a sniff of a plant and they’ll mention how cute it is, well I sniff things all day long in the house and it’s barely even mentioned. The best part of the patio experience is the fountain. It’s quite large, it’s multi-tiered, it attracts birds, and recently fish were added to the bottom pool. What could be better? I can even get a little drink while I stare at the fish slowly making their way around the basin - although the water tastes a lot better fresh from the faucet. 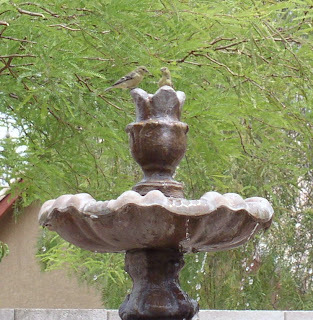 This morning there were five finches all enjoying the fountain at one time. One on the top layer sitting right in the water flow and splashing about, and four small, tasty, ones on the second layer getting a bath or having a little drink. Okay you probably caught that slip, I’ll confess, I don’t really know if they’re tasty or not. They’re small and I’m guessing there isn’t a lot of meat to be had. I make those Ka, Ka, Ka sounds, to indicate I’d like to chase them, but it’s really not worth getting up from my lounging to make a go of it. Maybe there was a time, in my younger years, when I would chase them, although what I’m really supposed to do if I ever caught them is still a mystery to me. I’ll indulge my bird cravings with chicken scraps from my parents. Hope you enjoy your week and all the nature available to you.